A CONFERENCE of trade unionists and left Labour MPs at TUC headquarters last Saturday launched a new Labour Representation Committee to bring together the three main sections of the Labour Party – the constituencies, the unionists and the MPs – to promote socialist policies within the party. This is an attempt to reclaim the party for socialism and pro-working class policies at home and abroad – an end to the privatisation of public services and an end to British participation in the illegal occupation of Iraq. The first Labour Representation Committee, founded in 1900, was part of the process that brought the Labour Party into being. Representatives of the Independent Labour Party, the Social Democratic Federation, the Fabian Society and trade union leaders met and agreed to establish “a distinct Labour group in Parliament, who shall have their own whips, and agree upon their policy, which must embrace a readiness to co-operate with any party, which for the time being, may be engaged in promoting legislation in the direct interests of labour”. They established a committee of two ILP members, two from the SDF, one Fabian and seven trade unionists. Keir Hardy led it and Ramsay MacDonald was the secretary. The LRC started putting up candidates in parliamentary elections. Within six years it had 29 MPs and changed its name to the Labour Party. Mick Rix, former general secretary of the train drivers’ union Aslef, chaired the conference. It was funded by various trade unions. Speakers included former minister Michael Meacher, veteran Tony Benn and MPs John McDonnell, Lynne Jones, Alan Simpson and Alice Mahon. Zeynab Tarish, an 11-year-old Iraqi girl who lost 17 members of her family and a leg in bombing near Basra also addressed the conference. Mick Rix told the conference: “We are reclaiming and re-equipping the party that we have. Tony Benn said: “What we are trying to do is ensure that we get a Labour government elected at the next election, but on a more radical agenda. “It is about supporting public services and not privatising them. It is about not going to war, and it is about peace. MP Alice Mahon, who has consistently campaigned against the imperialist wars in the Balkans, in Afghanistan and in Iraq said: “I think rank and file members are asking for us to do what we were born to do and that is to promote social justice. “Certainly the Iraq war has traumatised many members, who saw it as an illegal war, who are very worried indeed about the way the occupation is progressing. “So there are all those issues. But we also want to get back to the issues that founded the Labour Party. That is social justice, equality in the workplace fair play for workers. And there are some concerns that the European constitution might offer more to employers than employees. “All those things are up for discussion. After nearly 50 years in this party I think I am entitled to talk about a free NHS, one that is absolutely committed to giving, for example, long-term care to elderly people. Unions supporting the conference include the RMT transport union, the Fire Brigades Union and the Communication Workers’ Union. RMT was officially expelled from the Labour Party last year for supporting election candidates standing against Labour. As a tactic this had little impact on the Blair clique. Many other unions have come under pressure from some of their members to disaffiliate from the party because of the anti-working class policies of the Blair clique. Most of them, including the FBU and the public sector union Unison, are backing the LRC as a more effective way of defeating the Blair clique. 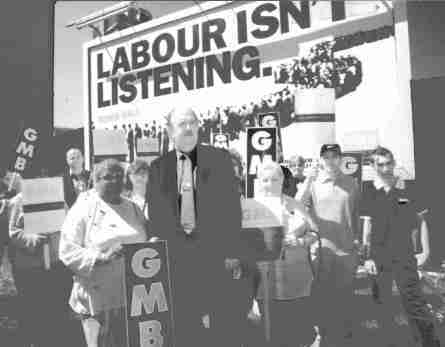 The GMB general union last week announced that it is totally cutting its donations – some £750,000 – to the party as a whole and giving the money instead only to MPs who are committed to supporting a working class agenda. The TGWU is considering a similar move. This would reduce the party’s campaign fund for the next general election by £1.5 million. Other unions could follow suit. This will exert enormous pressure for a real change in leadership and policies for the party. It will still be social democracy rather than revolutionary socialism but it will move the whole political agenda a big step to the left and benefit workers at home and abroad. . THE LAUNCH of a new Labour pressure group last weekend reflects the growing confidence amongst the left within the labour movement. Though its core is clearly the Socialist Campaign Group of Labour MPs, its appeal is aimed at a much broader section of Labour opinion within the party and the trade union movement. The new Labour Representation Committee (LRC) aims to build a “socialist consensus” aimed at seizing back control of the Labour Party from the Blairites. The conference, the result of over six months work, was funded by three major unions and backed by former Cabinet ministers Tony Benn and Michael Meacher. And the new campaign will unite opposition to Blair & Co in the constituencies, the unions and the Parliamentary Labour Party. In themselves their demands – increasing higher rate income tax, restoring trade union rights, and restoring genuine comprehensive education – are quite modest. Nor are they in any position to mount a left challenge to the leadership. And the tactical avoidance of any debate on the European Union and omission of any call for blanket re-nationalisation reflects the nature of this broad alliance. But the establishment of a centre left social-democratic platform inside the labour movement is in itself a major step in the move to oust Blair and his supporters. The success of the LRC will depend on winning support from the unions and the TUC hierarchy. Key unions have already given some significant backing at leadership level. Now the work to build a grass-roots organisation has started to expose and defeat the class collaborationist policies of Blair and Brown and rededicate Labour to the core values of its founders – the British trade union movement. Whoever succeeds Blair, and few doubt he’s on his way out these days, must respond to the demands of working people if Labour is to have any chance of a third term in office. If you find these articles from the New Worker Online interesting and useful them why notsubscribe to our print edition with lots more news, features, and photos?